Increased competitiveness, complex business processes and technology explosion has lead to a compulsion of specialized skills marked as a mandatory for individuals involved in delivering these business services. Foundation level knowledge is nowadays a pre-requisite for perfoming service management activities, at the same time, it is also important to have specialized knowledge and expertise in handling practical real-life situations. The ITIL Intermediate Qualification : Service Transition is part of the ITIL Intermediate lifecycle stream and one of the modules that leads to ITIL Expert in IT Service Management Certificate. • Instructor Led - Complete Classroom Learning with limited class size. The course includes work-based practical activities and discussions as well as real-life case studies. • Exam Duration: Maximum 90 minutes for all candidates in their respective language (Candidates sitting the examination in a language other than their first language have a maximum of 120 minutes and are allowed to use a dictionary). In this course, you learn how to plan, execute, manage and optimise the service transition processes. Through personalized coaching, practical assignments, real life case studies, practice (mock) exams and extensive review sessions, you not only gain the requisite knowledge to take the ITIL Intermediate Qualification: Service Transition Certification Exam but also gain detailed insights in the service transition guidance as provided by the ITIL Framework. As mentioned in the Course Details section, you would be requiring to hold ITIL 2011 Foundation Certificate OR ITIL V3 Foundation Certificate OR V2 Foundation plus Bridge Certificate to attend this course and take the ITIL Certification Exam on the final day of class. Does this course counted towards the credits for ITIL Expert certification? What were the changes to the syllabus as part of change for ITIL 2011 Edition? Is this course aligned and updated according to the changes of ITIL 2011 Edition? Yes. 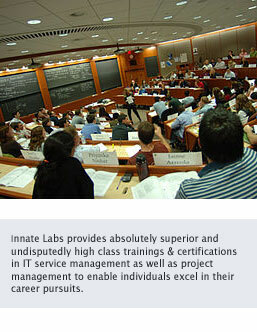 This course is updated as per latest ITIL 2011 edition. What are the changes being made to ITIL Service Transition : Best Practice Guidance book for ITIL 2011 Edition? The structure, content and relationships of the service knowledge management system (SKMS) and configuration management system (CMS) has been made more clear to enable the delegate to understand these key concepts with ease. There is new content detailing how a change proposal should be applied in practice. The evaluation process has been renamed as change evaluation, and the purpose and scope have been updated to simplify when and how this process should be used. The service asset and configuration management process contains supplementary content relating to asset management, and there are enhancement in the flow and integration of a number of processes, including change evaluation, change managementand release and deployment management. What is the difference between Lifecycle and Capability Qualification Certification? The Lifecycle and Capability certification forms the two streams/paths, or branches, of the ITIL intermediate-level qualification scheme. The Lifecycle stream-which includes the service transition qualification-consists of five modules or certifications. These certifications focus on the service lifecycle, the use of process and practice within the lifecycle and developing the skills needed to deliver quality service management practices in an organisation. The Capability certificates, which are made up of four modules, are focused toward those who want a thorough understanding of ITIL processes and roles. The primary focus is on activities, execution and use of the processes throughout the entire service lifecycle.